Jaghori is one of the Ghazni’s districts which is located in central-east of Afghanistan, and it is one of the districts comprised of Hazaras. The major roads which connect Jaghori to Kabul, the capital city of Afghanistan, and other major cities are controlled by the Tabliban. The Taliban have stopped vehicles, which have moved between Jaghori and other districts or cities, checked them, and killed whichever Hazara passengers they want. Up to now, hundreds of Hazaras who have been traveling from Kabul and other parts of Afghanistan to Hazaristan have been killed by the Taliban. 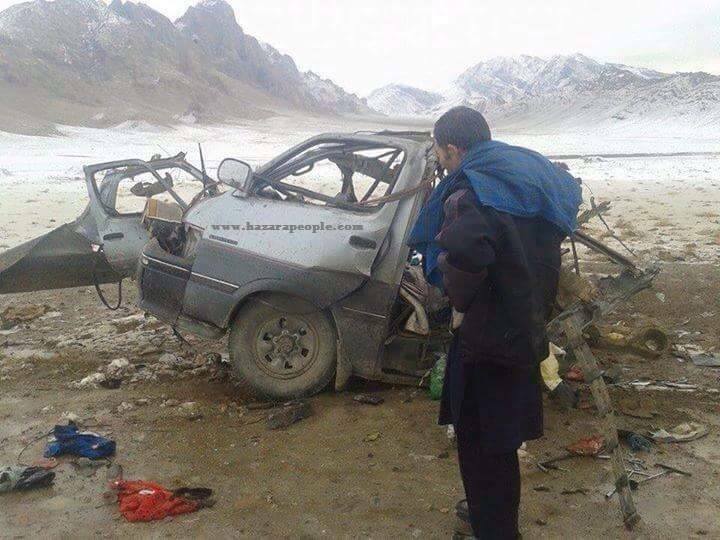 On January 20, 2015, nine Hazara passengers were killed by a remote controlled bomb and two passengers were seriously injured. Out of nine victims, six of them belonged to one family. These victims were civilians who were going from Kabul to Jaghori, did not work for any government offices and did not have any connection with any of Afghanistan’s political parties. This incident happened in Qalla-e- khoshk which is located in Gilan, one of the Ghazni’s districts, while the van was driving to Jaghori. During the election campaign the current president, Ashraf Ghani, chief executive, Abbudullah Abbudullah, and Mr. Mohaqqiq traveled to Jaghori by helicopters. They promised that they will make the Jaghori roads safe. However, after taking position in office, they have never paid any attention to Jaghori’s road and the innocent people who have been killed. Based on Etilaat Roz, one of the famous newspapers in Afghanistan, seven hundred foreign families have been settled around Jaghori, in Pashtun’s areas. These foreigners cannot speak Dari, and they mostly speak Arabic, Urdu, or Pashtu. It has been said by many citizens that these are members of ISIS. Of course, the current government of Afghanistan’s secrete agencies know about the presence of the ISIS in Ghazni, but they have never taken any action yet. If the government does not protect Hazaras, there is no telling how many more Hazaras will be killed by the Taliban and ISIS.